As your loved ones age, you may notice that they need extra support. While almost nine in 10 seniors want to remain at home in a familiar environment where they’re comfortable, they may experience mobility, memory or other daily living challenges. You could join 34.2 million Americans who provide unpaid care for an adult over the age of 50 each year. However, the strain of meeting your family members’ needs and caring for your own home, children, and job responsibilities can be overwhelming. In this case, you may consider hiring in-home care. What Is The Average Cost Of In-Home Care For Elderly Loved Ones? You want to care for your loved ones’ safety and well-being but likely wonder if it’s affordable. Understand the cost of in-home care for elderly family members so you can make the right choice for their care. The rates for in-home care vary by state. However, Genworth Financial conducted a survey and found that the national average is $4,000 per month. In-home caregivers typically charge by the hour. The average hourly rate comes to $20. The most expensive hourly rates are charged in North Dakota ($27), Alaska ($26) and Hawaii, Massachusetts, Minnesota, Rhode Island, and Washington, DC ($25). The least expensive hourly rates are charged in Louisiana and West Virginia ($16), Alabama, Arkansas and Mississippi ($17), and Georgia, North Carolina and Tennessee ($18). While it’s helpful to know the cost of in-home care for elderly relatives across the nation, remember that additional factors can affect what your loved one pays for care. Consider these factors as you customize care for your loved one based on his or her needs and budget. In-home care costs fluctuate based on the services your loved one receives and the tasks the aides perform. For example, you may pay more to hire a caregiver with years of experience or one that is willing to work flexible hours rather than a set schedule each week. Discuss your family members’ specific needs and the services you expect an aide to provide as you determine the cost. The amount of care your loved ones need can determine the cost. Most in-home care agencies charge per hour and may require you to pay for a minimum of two to four hours of care per day. You may also choose all-day care, if your loved one’s condition permits. To stretch your budget, you may hire a caregiver only on certain days of the week or for only a few hours a day. You may also ask friends or other family members to cover the rest of the day. While you will pay less for fewer hours of care, make sure your loved one receives the right amount of care to ensure his or her safety and well-being. Expect to pay more for in-home care depending on where your loved one lives. Your cost may fluctuate based on how far the aides must drive to work or how many other aides work in the area. Before hiring an in-home aide to care for your loved one, you will probably interview several agencies. They will assess your loved ones’ needs, determine how much care your family members require and prepare an estimate of the cost. 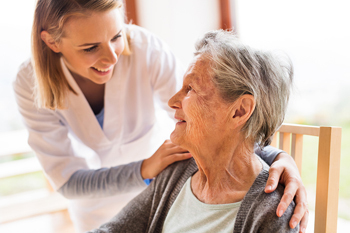 The right agency will then provide qualified and compassionate caregivers who are a good fit with your loved ones’ personality, interests, and needs. To save money, you may be tempted to choose the agency that provides the cheapest quote, but keep in mind that quality and experience matters, too. You and your loved one can pay for essential in-home care in several ways. Cover in-home care expenses from your own income, savings, or other sources. Health insurance, Medicare, Medicaid, Veteran Administration benefits, or another insurance agency may cover all or a portion of your loved one’s in-home care. Friends, family members or other private citizens can contribute financially to in-home care costs or host fundraisers to provide needed financial resources. What Benefits Come With The Cost Of In-Home Care For Elderly Loved Ones? In-home care aides assist seniors with a variety of tasks. Along with the services provided with in-home care, there are many advantages from which you and your loved one will benefit. Your loved ones feel comfortable at home and can use their familiarity with their home to improve safety. Additionally, you can perform home modifications that are specific to your loved ones’ needs as you create a customized home that prioritizes safety. At home, your loved ones can follow the schedule of their choosing whether they may prefer to sleep in, follow a strict chore regime, or visit with certain friends on specific days. An in-home aide can provide flexible care based on your family members’ preferences while ensuring your loved ones’ needs are met. With their focus on only one patient, in-home aides concentrate solely on meeting the specific needs of your loved ones. They also get to know your family members’ personality, interests, and quirks. This relationship and knowledge allow them to create a personalized care plan that’s a good fit for your loved ones and your family. Have confidence that you maximize the money you spend for care when you hire in-home aides. Your loved ones receive customized and uninterrupted care, and you won’t have to pay the aides to care for other patients or perform administrative tasks while they’re on duty. With this valuable in-home care assistance, your loved ones remain independent. You also gain peace of mind knowing that your family members receive professional, compassionate, and competent care. You can meet your loved ones’ needs and allow them to remain independent in their own homes when you hire in-home care. Know the cost of this care and its benefits as you provide for your loved one’s safety and well-being.